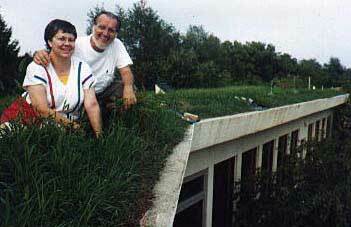 Sitting on their roof in the grass a few years back, Joe & Ceil are living proof that you can live comfortably without a furnace or central air conditioning. Firm believers in the possibility that we must be free of fossil fuels by the year 2020 (see What if Link), they pursue their passion to bring solar living to public attention. So much to do, so little time. In addition to Solar to reduce pollution, Joe found a way to avoid using petroleum oil in their cars to reduce environmental pollution and gain a Royalty income. This oil is a 100% man made synthetic lubricant called AMSOIL made in Superior Wisconsin by the Amsoil Company. The oil is produced as both a type III Synthesized mineral oil for 7,500 mile drain interval (same as Mobile I) or as a better product a 100% Synthetic type IV polyalphaolefin (POA) high mileage, extended drain interval (25,000 or 35,000 mile) motor oil. This is the stuff we need to reduce the demand on the petroleum (crude oil) pump. PAOs are commonly manufactured by reacting ethylene gas with a metallic catalyst. Think we can make it? I do! The question is, what are you doing about it? Are you going to wait for government or do something now? Through the use of a bypass oil filter system along with the spin-on filter, some vehicles (car or truck) can operate up to 100,000 miles (oil analysis kits required) before changing the oil. JR (as Joe likes to be called), and his sons are marketing these Synthetic lubricants with as many prospects as they can. If you have a car or have an over the road truck and you need to save money, you need to check this out TODAY by going to the dealer links in later pages. Born and raised in Cincinnati Ohio, Joe was a self-employed technical writer and documen-tation consultant who has worked in the home since 1985. 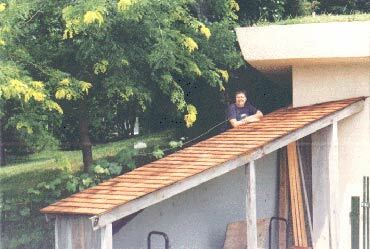 Joe lives in Blue Ash Ohio with his wife and lifetime partner of 40 years in a three bedroom, solar heated, earth sheltered (under-ground) home, that has earth and grass on the roof. Up untill this year, the yard also supported 16 Apple trees in the back yard, 2 cherry and 2 flowering crab apple trees in front, plus 3 apricot and two dwarf pear trees in the side yard. The flowering crabs were lost to fire blight. The cherries and apricots to borrers and old age. The drought this year has taken a toll on the others. There is only one way to get satisfaction when the job requires perfection and that is do it yourself. Here's Ceil showing what can be done with a bit of research plus some help from our two sons. Montmorency (pie) cherries in bloom (on right) with Indian Walk flowering Crabapples (red trees on left) in bloom.